Most people know Google Search. Pretty easy concept, Google user search for something and Google returns various websites in the results. The users chooses from among those websites. Likely most business owners know the less obvious Google Maps, too, although not associating Google Maps as part of the job of search engine optimization and up to date website design. Google Maps for businesses, generally, appears as a Google user searches what Google sees as a group of local businesses. 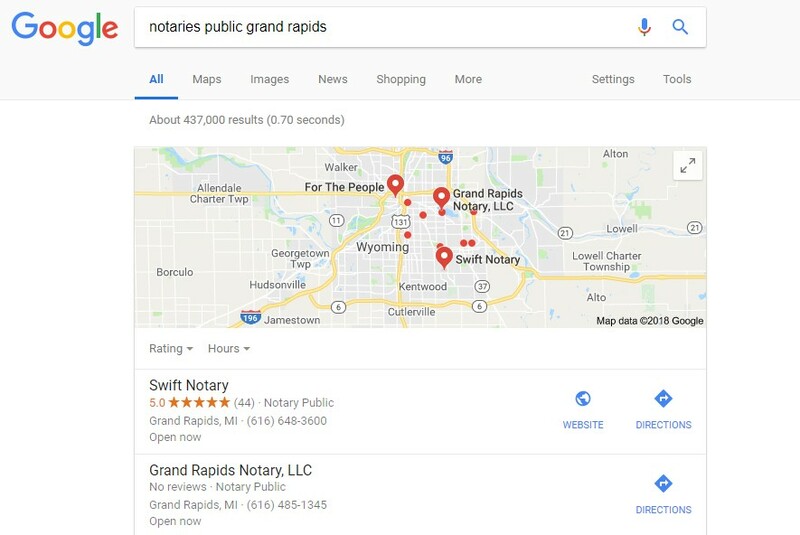 In the image example we see Google returning results for Notaries Public in Grand Rapids Michigan. Pegasus Ventures client, Swift Notary appears at the top in the Google Maps box appearing at the top under the area map of the Grand Rapids area. Swift tends to appear first for several reasons, (1) Swift Notary claimed her Google My Business, (2) she has the best reviews as compared to competitors and she uses the Google My Business platform. As with Swift Notary, every business gets better results using the free Google My Business platform. The active user answers reviews, adds images, responds to questions, and provides links to specific pages such as menus and online ordering pages in this easy to manage platform. Google users learn by clicking on the business name even more information provided by the local business. Those not using this tool find themselves disadvantaged not using this platform by appearing lower in Google Search, Google Maps and also negatively impacting the businesses website. Another pitfall of not using the platform? Google users submitting their own images to the Google My Business account whether the business manages the platform or not. It goes without saying one malevolent person can do an awful lot of damage management never sees not managing the account. In the Pegasus Ventures portfolio restaurants absolutely benefit from active management of Google My Business and by extension Google Maps. 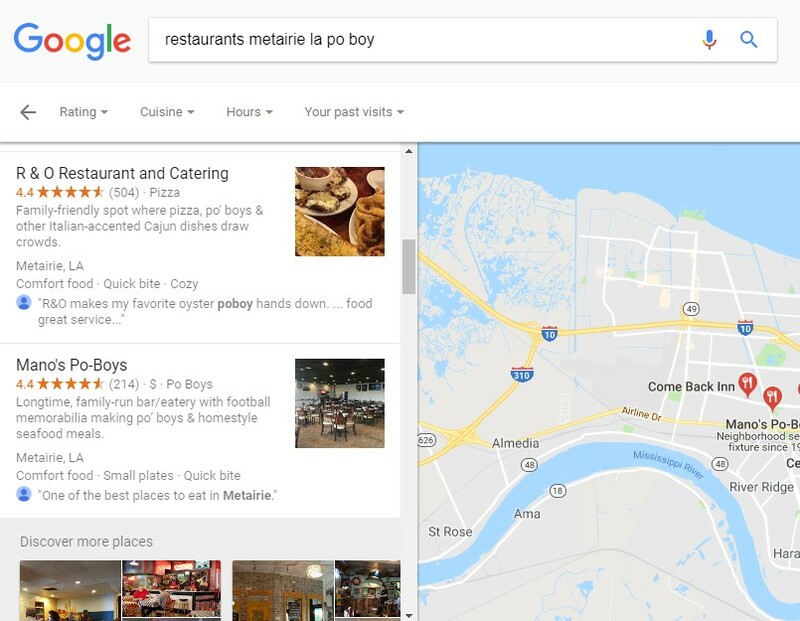 Google users often search nothing more than, “pizza near me” or in the case of the image shown, “restaurants metairie la po boy” where our customer, R&O’s appears prominently offering one of New Orleans favorite’s the Po’ Boy. Tap on the image for a close up! The image shows a search for New Orleans area favorite Po’ Boys in Metairie, LA. Using Google My Business is a big plus especially for restaurants.